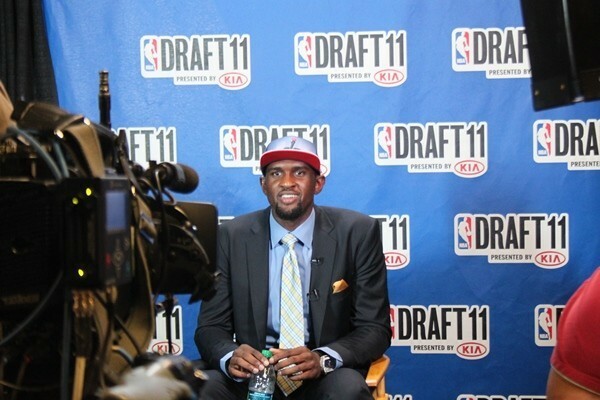 Today at 2:30 PM Ernie Grunfeld and Flip Saunders will introduce two of the Wizards 2011 draft picks Chris Singleton (18th overall) and Shelvin Mack (34th overall) at the Verizon Center. Earlier today Wizards announced that they have resigned guard/forward Alonzo Gee. The Wizards had originally signed Gee on March 7 from the NBADL and he appeared in 11-games in which he averaged more than 16 minutes and a little over 7 points per game. The Wizards had signed Gee to a second 10-day contract but ultimately Gee elected to sign a contract that let him remain with the San Antonio Spurs for the remainder of the season. The Spurs, who recently signed Danny Green, elected to waive Alonzo Gee. Unfortunately, Gee’s resigning meant that the Wizards had to create room on the roster and so Ernie Grunfeld also announced that the team had waived reserve Guard Lester Hudson. Hudson, who made a few exciting plays in the Summer League and during the preseason, appeared in six games with the Wizards. During that stretch he logged 26 minutes of play in which he contributed two points, six assists and one rebound. 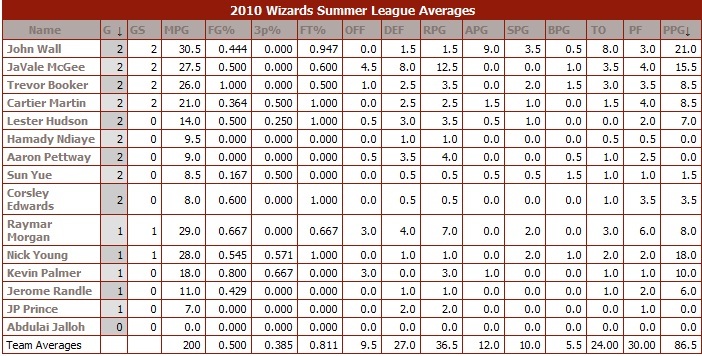 What can we conclude from the Wizards stats in the first two Summer League games? I know it is only the Summer League and we have only seen two Wizards games. However, tonight the ESPYs were on and I have refused to watch that mess since its inception. So as I was watching the Clippers and Sofoklis “Big Boy Schorts” Schortsanitis take on the Bulls, the thought hit me… what conclusions, if any, could we draw from the Wizards Summer Leagues stats so far? I know this sounds crazy, but hell I had some time on my hands. To no great surprise the Wizards staff has stuck to its goal of getting John Wall, JaVale McGee and Trevor Booker better prepared for the season by getting them as many minutes as possible. And through the first two games, John is averaging a team high 30.5 MPG, JaVale is second on the team with 27.5 MPG and Trevor is close by with 26.0 MPG. All three players, who the team expects to be in the rotation this season, have been on the floor for more than 60% of the game. It is true that the 09/10 Wizards again missed an opportunity to win three straight games, the fact is that this is a very different team than the one that began the season. So in this sense, a new, shortened season began for this team on February 18th. And with this hard fought loss – against the current 5th place team in the East on its home floor – this version of the team is 2-1 since the All-Star break (19-34 overall). As I reflected on this game, I found myself feeling disappointed with the final outcome – which I thought was a strange feeling. Following all of the trades that Ernie Grunfeld made, with all of the new faces that were brought in, one would expect that this team would plummet, potentially giving the Nets a run for their money. However, the effort displayed over the first three games, has been the exact opposite of what one would have expected. I was disappointed because this team has changed my expectations of them. I expected them to win this game. And they nearly did. The Wizards led after a stellar effort in the third quarter, but the Raptors captured the lead in the fourth after outscoring the Wiz 24-16. The Wiz did not get enough stops on the defensive end, had a few untimely turnovers and their inability to contain Jarrett Jack ultimately did them in. However, for a third straight game they brought a tremendous amount of effort, heart and grit. Three characteristics that this team has not always exhibited over the last two seasons. And these characteristics lead me to believe that if they consistently bring them into every game, they will win their fair share of games – at a minimum they will be entertaining and competitive. The Wizards new fond energy and effort is the reason that I thought they would pull this game out. Yet, I admit that it is a strange feeling… I know. Following the trades, giving up as much “talent” as they did, and on paper at least, not receiving “equal value.” I expected to be watching the Wizards to see how many ping pong balls they would “earn.” Through three games their effort and, at times, execution have been impressive. There are times when it is easy to forget that the majority of these players have not logged major minutes together and in fact three of the players have been with the team for less than a week. They have their mental lapses – that is expected by players that barely know each other. They still have a few players – Dray and JaVale immediately spring to mind – that will reach at an offensive player, rather than cutting him off as he drives to the basket. (They desperately need to spend more time on this with these two players in particular.) But let’s face it, virtually all of the players they traded, with maybe DeShawn and Dom as the exceptions, played defense this way routinely. Now they have at least three players who are playing with effort on the defensive end and that effort can be and is contagious. What Howard, Singleton and Ross lack when compared with Jamison and Butler on the offensive end, they have more than made up for by their effort and energy – particularly on defense. I would also point out that while on the surface this team gave up talented offensive players this team so far has been playing very well offensively. They have now had three straight games scoring more than 100 points. The last time this team did that was December 1 – 4, when Gilbert was still on the team. The point is that while they traded two gifted offensive talents, this team still has players who are capable of scoring points. In the fourth quarter when the game unraveled a little and the Raptors took the lead, this team could have folded, but it didn’t. They had a chance late to potentially tie the game, but ultimately came up a bit short. The Wizards for three straight games gave great effort and played with heart. Over the last two seasons there have been countless Wizards games that were painful to watch. These last three are not included in that. Win or lose, if they continue to give this type of effort, I and many other people will look forward to watching this team play. In other sports, like the NFL, we glorify the teams that seem to not have the best talent at every position, but manage to routinely find the hungry overachievers that form the nucleus of a successful team. For example, how many Pro Bowl players do the Patriots and Steelers have each year, compared with other teams, but yet they are two of the most successful teams over this last decade. Believe me; I am not letting myself get carried away by a couple of games. I do not think that this team is going to make a miracle run to the playoffs – personally I rather they continue to play with energy and grit, while remaining in the lottery. While not a perfect effort for 48 minutes, I was impressed with Nick Young diving for balls, players hustling back on defense, Josh Howard’s beer crunching attempt at a lose ball, the Wizards picking up their defense in the backcourt… THE BACKCOURT! I liked the fact that this new collection of parts – or as a commenter on Bulletsforever put it, “The Replacement Killers” – are hungry! They have something to prove and early into their tenure with the Wizards are playing like it. I can’t remember a player on the Bullets/Wizards over the last 15 years playing defense on the other team’s superstar like Al Thornton did. And on the offensive end of the court they made shots. But just as importantly, they did not give up on plays and drift back up court, they actually fought for rebounds. They fought for rebounds even with a CRAZY small lineup on the court – who was their center??? That was the craziest lineup I can remember seeing, but it worked. An effort like this, win or lose, is great to watch. However, it also elicits another emotion from me – anger. It makes you wonder why this team with Gilbert, Antawn, Caron, Brendan and DeShawn couldn’t play with this same type of effort. What could that team have accomplished if they truly played this hard? I got used to the other team winning all of the “hustle plays.” Today, the Wizards won those plays. For much of this season the Wizards pretended to play defense, today they actually played some particularly when it counted most. Could you imagine a Wizards team that actually held Carmelo scoreless in the 4th quarter?!?!? Yes, this was a Nuggets team that just came off an emotional (and likely physically draining) overtime win against King Crab Dribble and the Cavaliers. But this is also a Nuggets team that is deep and has superior talent. The Nuggets were mostly playing against a collection of inexperienced young guys and cast-off role players. I hope the Wizards learned an important lesson today. If they play with this level of effort and passion, even as presently constructed, they can play with any team in the NBA (at least for the rest of this season). For one game, I forgot that this was a 17 win team. It was fun to watch this team go out and compete. If they continue to play like this, I look forward to watching the rest of their games. What these players offered tonight the Wizards need moving forward in 2010-2011. Ernie and the coaching staff need to figure out how many of these guys to keep (and at what price). But Thornton and Singleton in particular play with an edge that has been lacking in this team for quite some time. Gilbert, I hope you were at home watching this effort tonight. I have been watching and reading all of the coverage concerning the Wizards recent changes and decided that I would take the time to jot down some of my thoughts. In broad brush-strokes, I am glad that Ernie Grunfeld and the Wizards finally decided to make significant changes. Now in hindsight it is easy to suggest that the Wiz could have probably received more in return IF they would have made changes during the summer and/or earlier in this season (before the wheels fell off). However, I do understand his thinking that with everyone coming back healthy this would be a good year to see if they could recapture what they had a few seasons ago. Sadly, it did not work. I’ve enjoyed watching Antwan Jamison, Caron Butler and Brendan Haywood and part of me is sad to see them go. I understand the issue that some have with the trades, that it appears that the Wiz – outside of getting below the luxury tax, significant cap space and prospects (primarily in the form of a couple draft picks, Al Thornton and the rights to a Euro player) – did not get equal value. I understand those feelings, but the Wizards were not in a position of strength and each of those players had a little baggage as well – for example Antwan’s age and the size of his existing contract. The Wizards won 19 games last season and 17 games this season with the players that were traded (or are not currently playing) primarily leading the way, so the idea that they can not live without any of them is a false argument. And in fact, as many have pointed out, the existence of many of the traded players – and the size of their contracts – prevented the Wizards from adding the talent that they were lacking. This fact finally seems to be clear to Ernie and the Wizards brass. Assuming Gil Arenas is back with the team next season, the Wizards have the ability to go out and add a significant piece or two in free agency, as well as some young talent with their draft picks. If ultimately the Wizards and Arenas part ways, then Washington will have even more cap space, but then the rebuilding process is likely even longer as it might be more difficult to convince two or more key free agents to come to Washington together. For the remainder of this season I am looking forward to seeing the “Young Guns” prove that they can play in this league, consistently. One of the mistakes that I thought the team made last year, was not by letting them (in particular JaVale) play heavy minutes. The Wizards now have 31 games to determine what they have in the young guys on this squad.